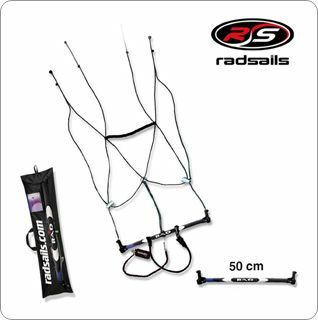 The crossover bar for the Radsails range has an increased crossover system for use on all sizes of Radsails. The front lines always attach to the lines which come from the bar. The rear lines attach to the lines which run through the pulley, giving a crossover system ideally suited to these bigger kites. Radsail Crossover Kite Bar works perfectly with any of the Cirrus Pro range giving an awesome new way to fly these kites. 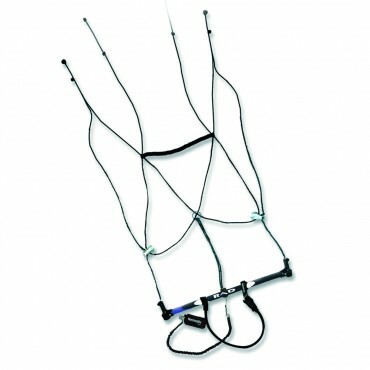 The bar has two separate safety systems and a landing strap, ideal for use with a harness and kite board. The Radsail Crossover Bar also has an emergency release system for dumping power out of the kite. 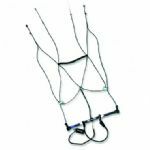 Simply let go off the bar when you are hooked into your harness or safety system and the kite falls to earth on the rear lines. No release pins or shackles needed. This bar is 100% compatible with any other four line power kite in the market.